No matter where your church is, big or small, we’ll bring your church pews directly to you. We’ve installed church pews all across America and even Canada and want to continue our ministry of installing pews in churches wherever they are needed. We make our pews in Twin Oaks, Oklahoma, but once the pieces are ready to go for your order, we load them up into our trailer and drive however long it takes to bring them to you. Once we’re there, we assemble and install all the pews on site, making sure that the pews are installed just the way you want. 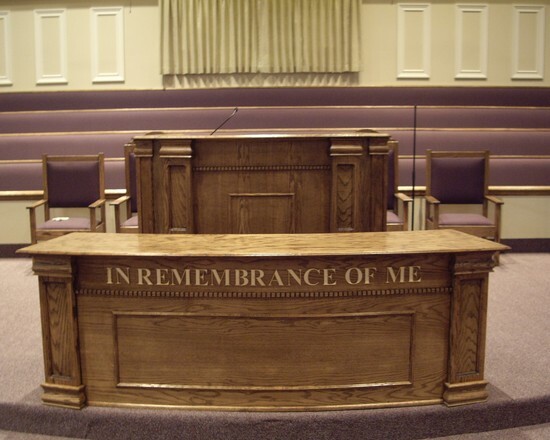 We’ve developed strong relationships with the congregations where we have installed pews in the past—when you buy our pews, you’re also getting us! As we always want to serve the Lord in everything we do, we will help you every step of the way, even after your pews are installed. We guarantee our pews for life and will come back if you need us. Everyday for us is living in God’s name: Not slothful in business; fervent in spirit; serving the Lord (Rom 12:11) It’s our calling from God to serve churches by providing the best pews on often tight budgets—our goal is to give your church the best pews and church furniture for a low price so money can be used for ministry. As our mission is to provide the best pews, we take time to handcraft each piece individually and give our church pews the quality, value and reliability God asks of us to give. We want to get to know your congregation so we can best serve your church’s particular needs, no matter what changes many comes down the road. God’s love knows no bounds and we try to embody that spirit by traveling wherever pews are needed, no matter how long a journey! If you’re in need of new church pews, take a look at our catalog and then give us a call so we can get to know you and your needs.